Sometimes the left needs to do a little housekeeping to be certain their sheep understand that when you are a shill for "The Party" (TP-D), there is NO SUCH THING AS HYPOCRISY! Once you have slipped the surly bonds of "values" and "truth", your choice to use some of the lucre that has stuck to your fingers for your 3rd home, and having it chime in at well over half a million is a privilege of being part of TP! You stole that money "with the best intentions"! WaPo reports this one mostly straight up, but you can tell they are concerned that not all the more left wing TP members in good standing fully understand that rules just don't apply and a pass must be given! Party on Bernie! For his part, Sanders has yet to respond to the criticism and calls for donor refunds. He’s probably too busy writing his forthcoming book. “Our Revolution: A Future to Believe In” is set to hit bookshelves on Nov. 15. What a SUPER title for his book ... "Our Revolution, A Failure to Believe IN!" 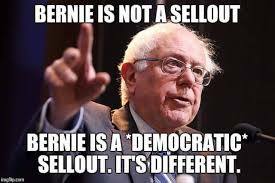 ... remember, the Bern is not a sellout, he is a DEMOCRATIC sellout!